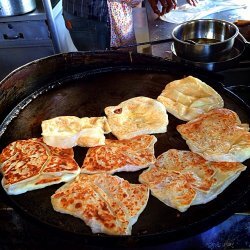 This popular prata stall is located at quite a secluded spot around Joo Chiat area. We managed to find it after 10 minutes of walking from the bus-stop. Anyway, there was a long list of orders and we waited around 25 minutes before we got our pratas! 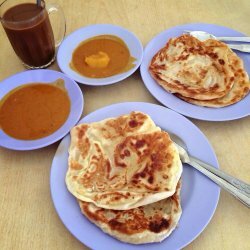 My usual order for a prata breakfast is one kosong and one egg prata. Between the two, the kosong prata really stands out with it being fluffy inside and crispy outside! I forgot to ask for either a fish/chicken/mutton curry and Mrs Mohgan served us Dhal. Personally, I like fish curry and went to ask for it. It is really much better than having your prata with Dhal!